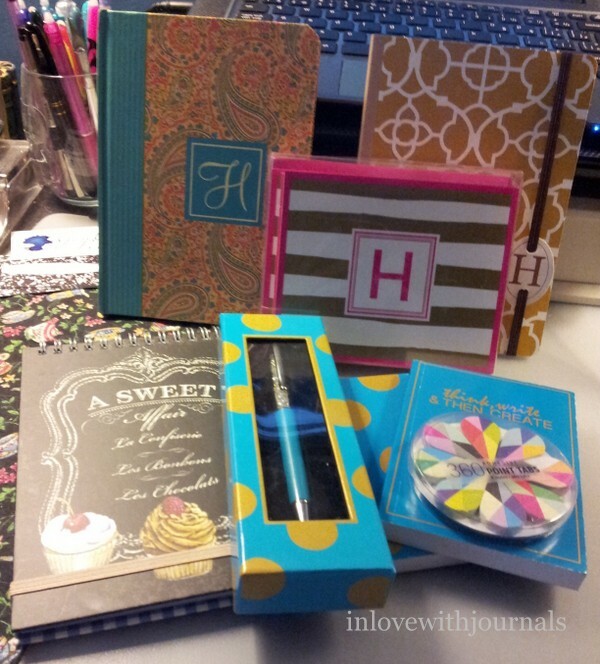 Another year older and some new stationery items to review! My friends really know what I love. The 360 Adhesive Point Tabs from Girl of All Work Accessories were a sweet surprise when I got into work on Friday. I love Girl of All Work; they have such beautiful products. These Point Tabs are the Rush pattern, and they are super cool. 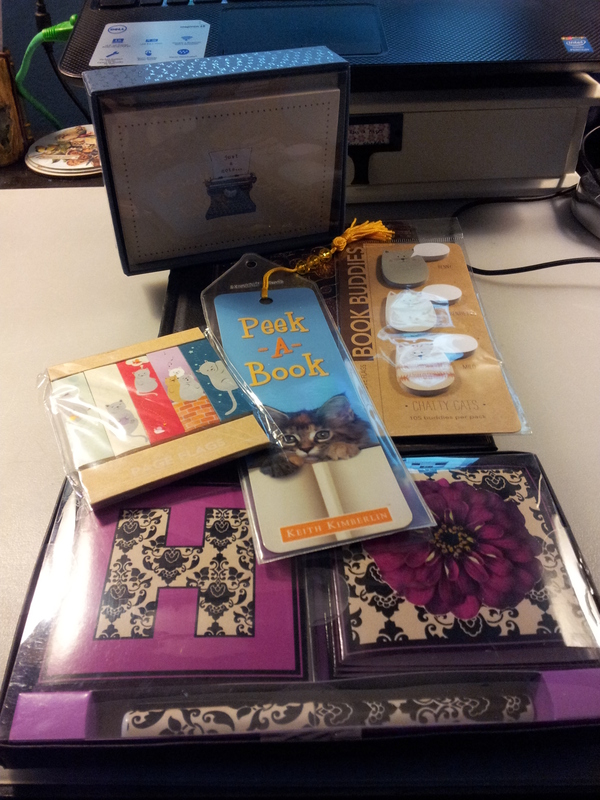 Then another great friend presented me with a bagful of awesome stationery!! 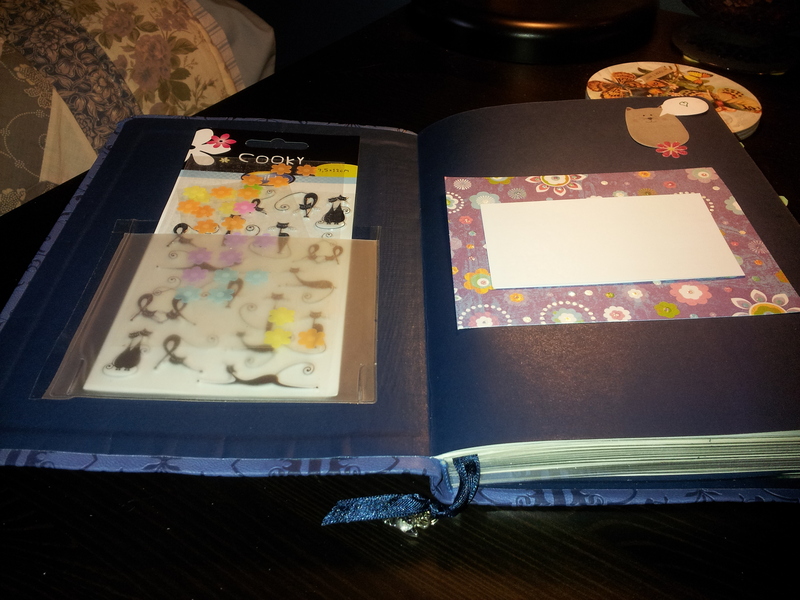 The two standing journals in the back as well as the black cupcake notebook in the foreground are from Carnet. 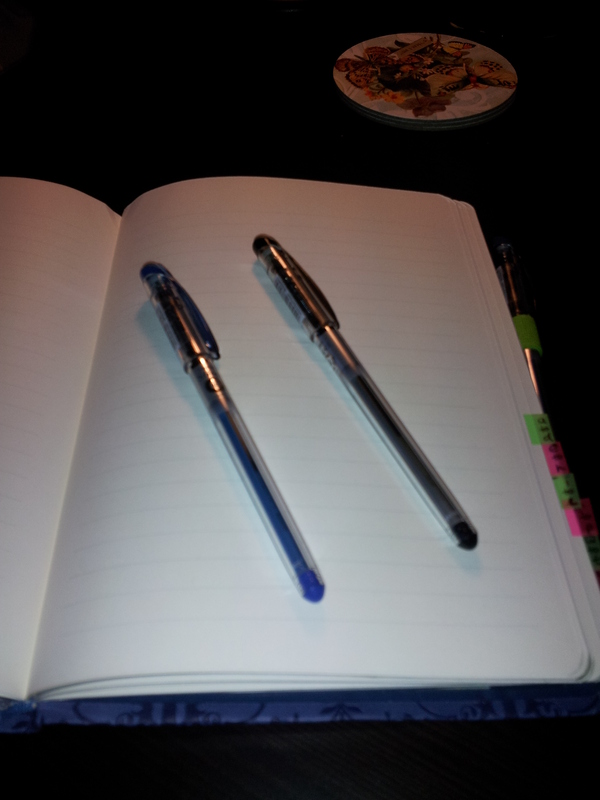 They are lined, wide-ruled, and the paper feels really good. I will do ink tests when I use the notebooks. The paisley one and the chalkboard cupcake one are hard cover, while the gold and white geometric design is soft cover. 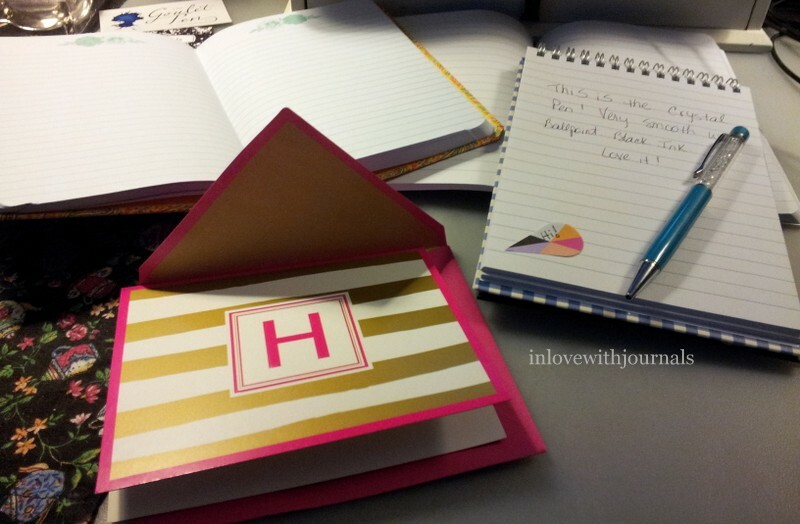 The pink and gold monogrammed notecards are from Michael’s and I think the blue and gold mini notebooks and the pen are also from Michael’s. The pen is known as a Crystal Pen and I’ve seen many YouTubers rave about them for their planners. 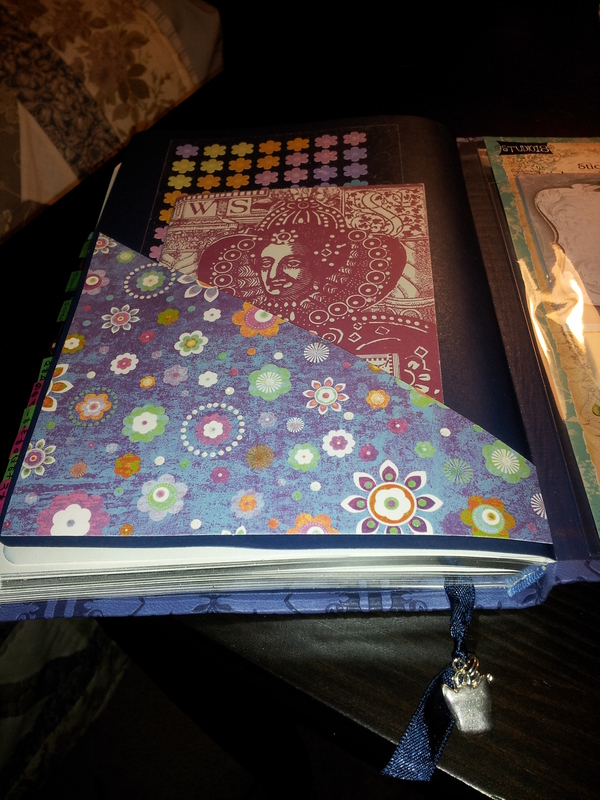 The paisley journal (top left) has blue lines with a beautiful flower pattern at the top of each page. (Sorry for no closeups; pressed for time.) 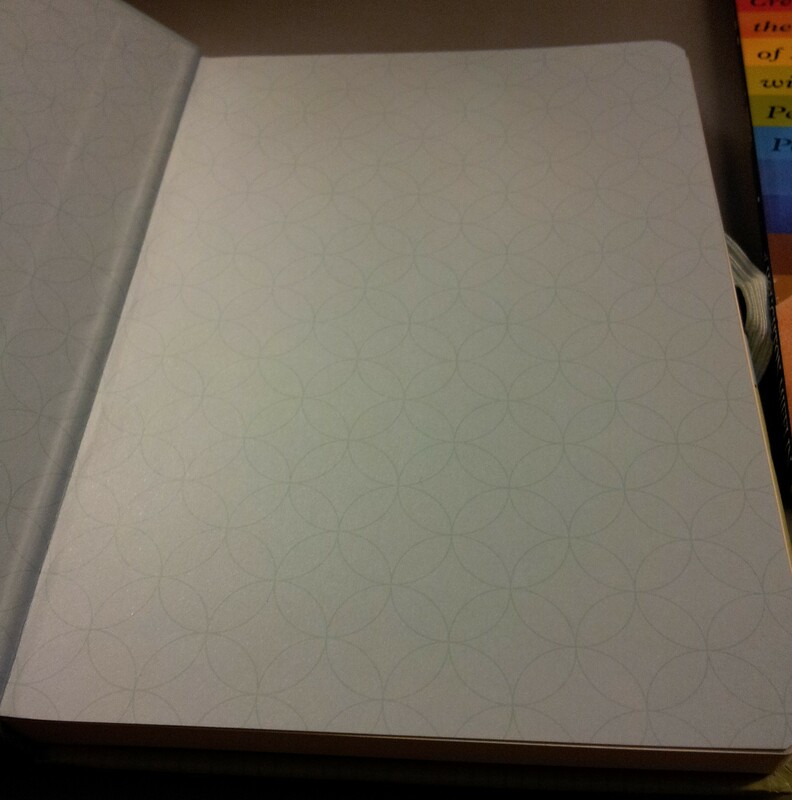 The gold geometric soft cover notebook is open at the top right and has light lines, and opens flat, just beautifully. 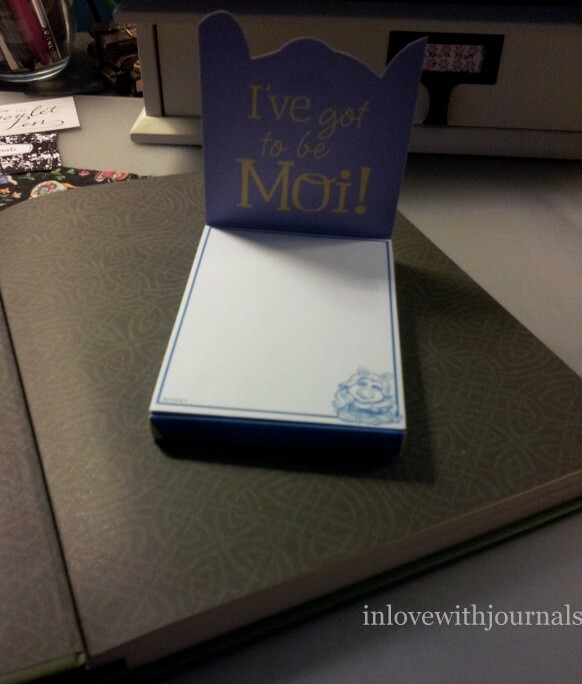 Same with the reporter-style notebook (black with cupcakes on the cover): standard white paper with light blue lines. I stuck a Point Tab sticky on the page and it adhered really well. I did a writing sample with the Crystal Pen and it’s a very smooth writer, with light black ink. I’ve seen refills online so that shouldn’t be a problem. And the notecards are heavy cardstock with a nice surprise in the envelope: gold lining. Fancy! And then two other beautiful friends included these lovely items in their presents to me. 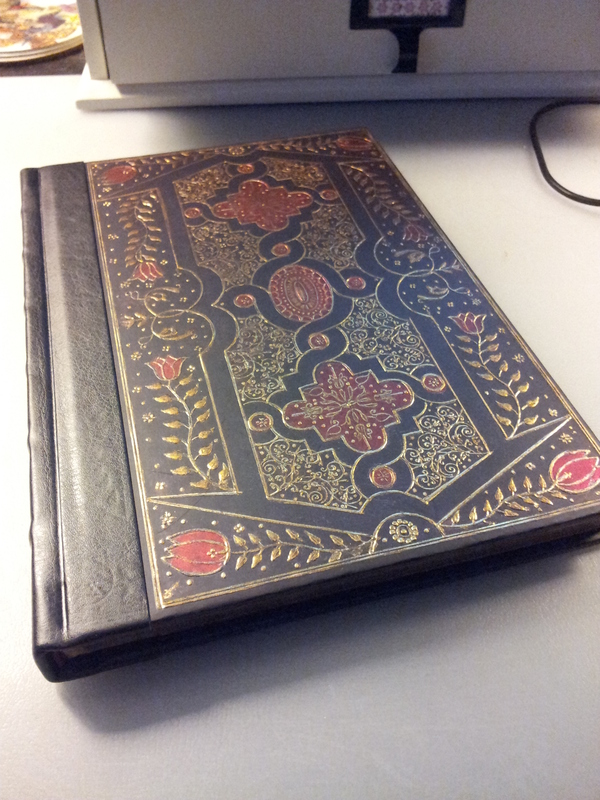 I love this STUNNING Celtic notebook by Peter Pauper Press. I have never seen this pattern and I’m just thrilled with it. 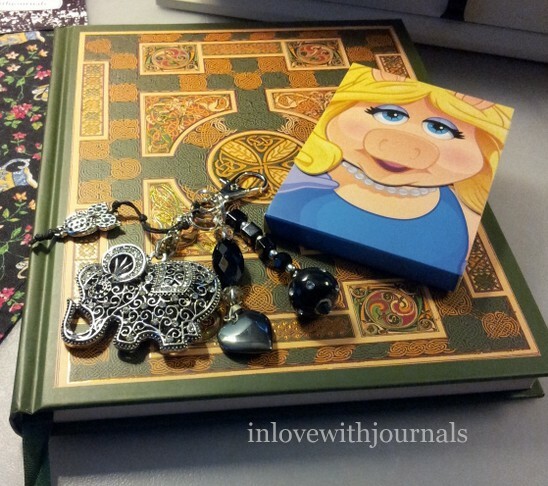 The ornate planner/purse charm will look gorgeous on my planner I think, and the Miss Piggy note sheets are hilarious. The journal is actually called the Celtic Colours Journal and here’s the inside endpaper. This paper was a surprise – so beautiful! It is very lightly lined and a beautiful tan colour. And that gorgeous green ribbon! 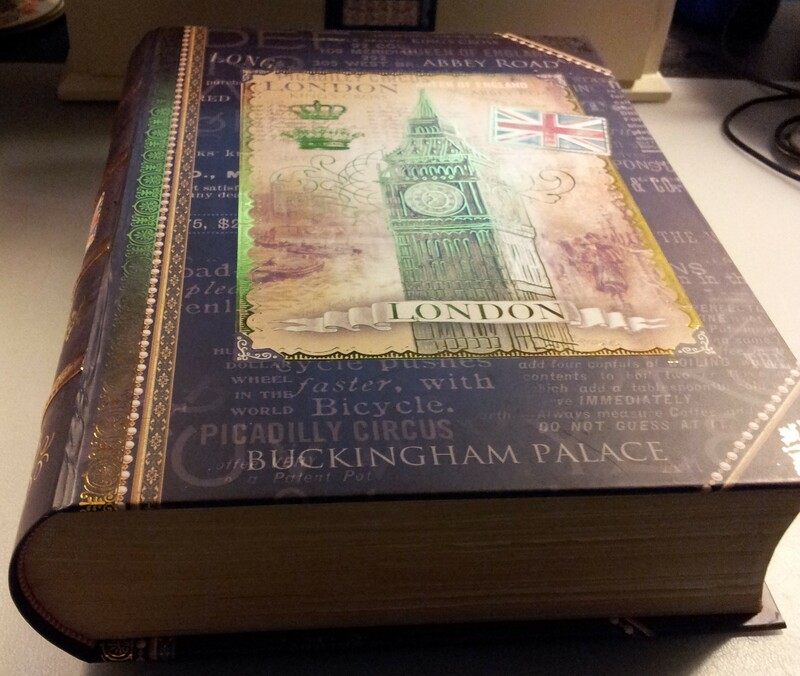 Very special notebook. 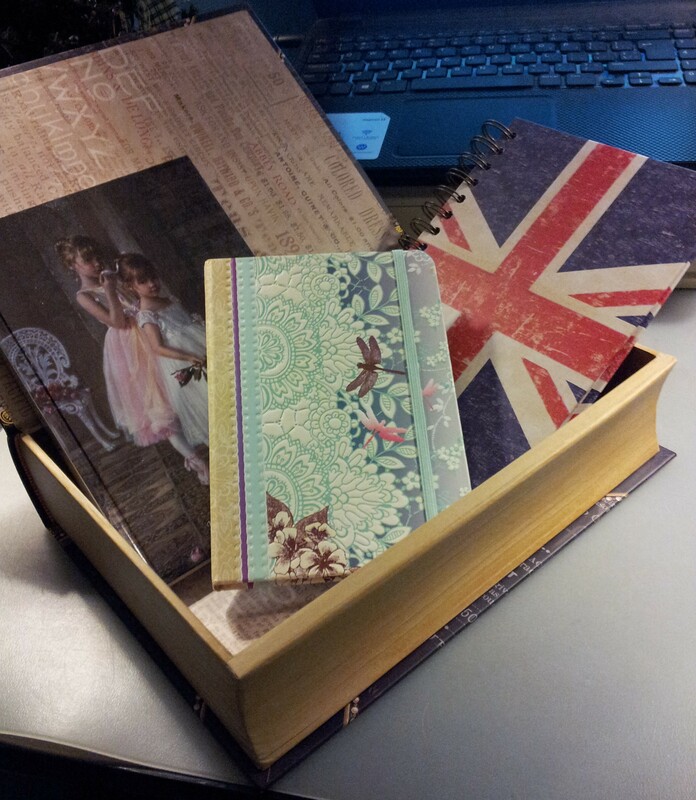 Thank you to my lovely friends who spoiled me with these beautiful notebooks and stationery! It means so much to me that I can share these wonderful items with all of you. I have a small crystal collection, consisting of rocks and minerals that I have purchased or been given. Sometimes the crystals have found me! I’m fascinated by their rumoured magical properties and I have to admit some of them feel very powerful to me. You can buy them in gift shops and in stores devoted to all things geological. I have pendants, bracelets and key chains. I also have a book called The Complete Crystal Handbook. 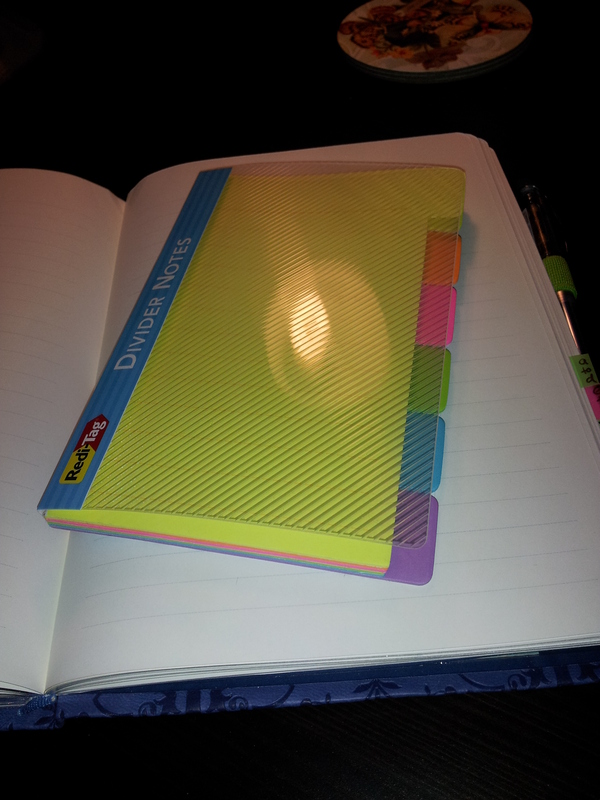 I have lots of information about them from various sources and I wanted a journal to keep all of that info organized. Today I chose one and got started. You might recognize this from my post of Oct 18, 2014; my good friend Dawn gave it to me for my birthday last year. 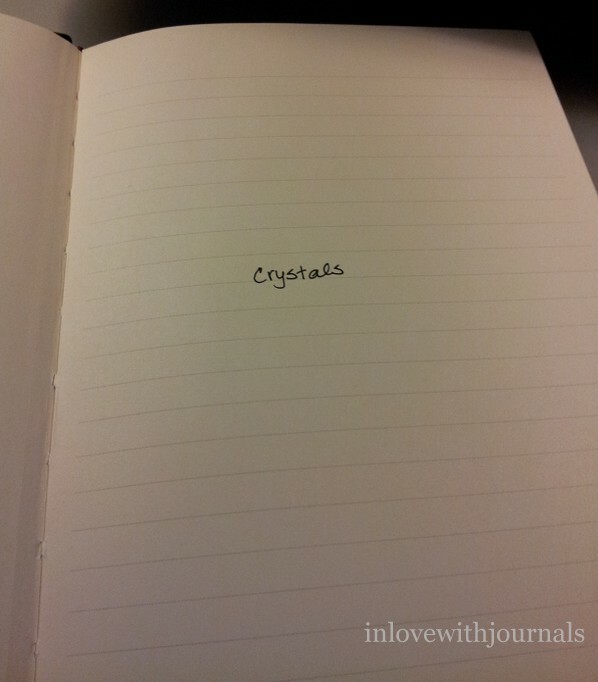 When I thought about organizing the information I had been gathering on my crystals, this was the journal I thought of. No fancy cover page; just the subject of the journal. I added a Table of Contents although it won’t be in alphabetical order once I start adding to my collection. But at least it will have some organization. I took pictures of the pieces I own and printed them on my LG Pocket Printer. I also have pictures I printed from my internet research which I will add later. The purple information card is from a local store, EarthGems, which is a fantastic treasure spot for crystals and stones from all over the world. The rest of the info is what I have read online and in my crystal handbook. So that’s my Crystals Journal. I feel better knowing my research is contained in one book, which I can read and add to as I learn more. You could apply this method to any field of study you are interested in. 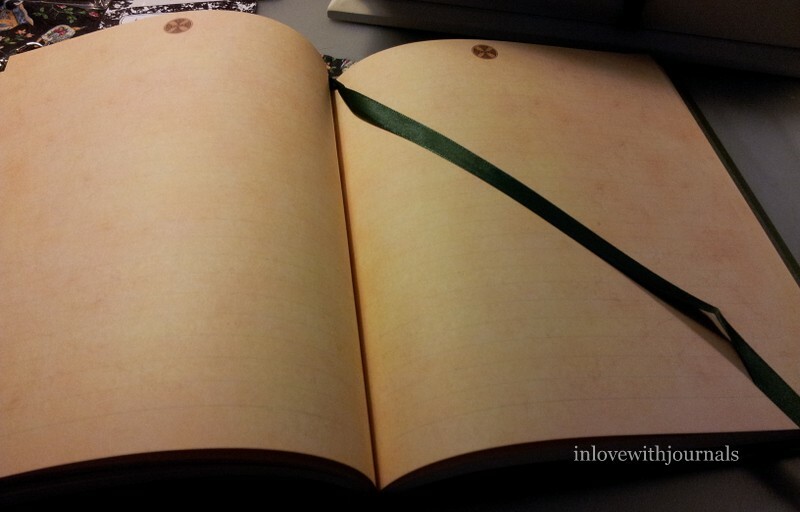 It’s another example of a themed journal with practical use. Boy I’ve been spoiled this year! This is my fourth post about Christmas. I am very blessed to have friends and family who know me so well. I love this book box. I have a couple of small ones but this is a great size for bigger storage. 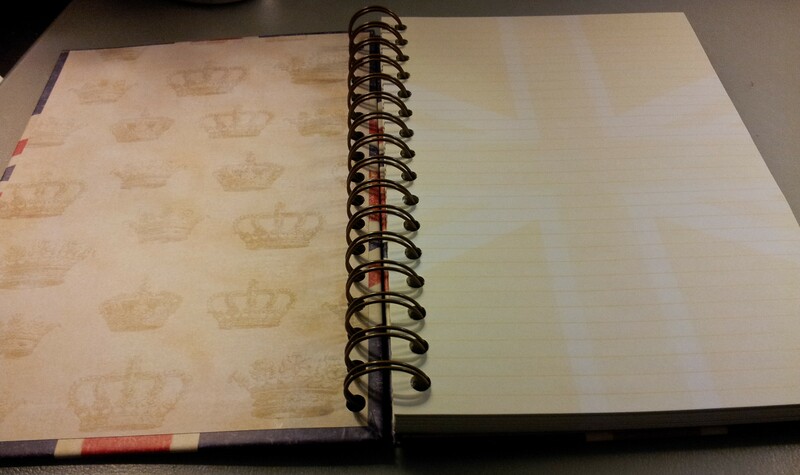 The Union Jack notebook came inside the London book box from a friend of mine. It’s from Tri-Coastal Design. 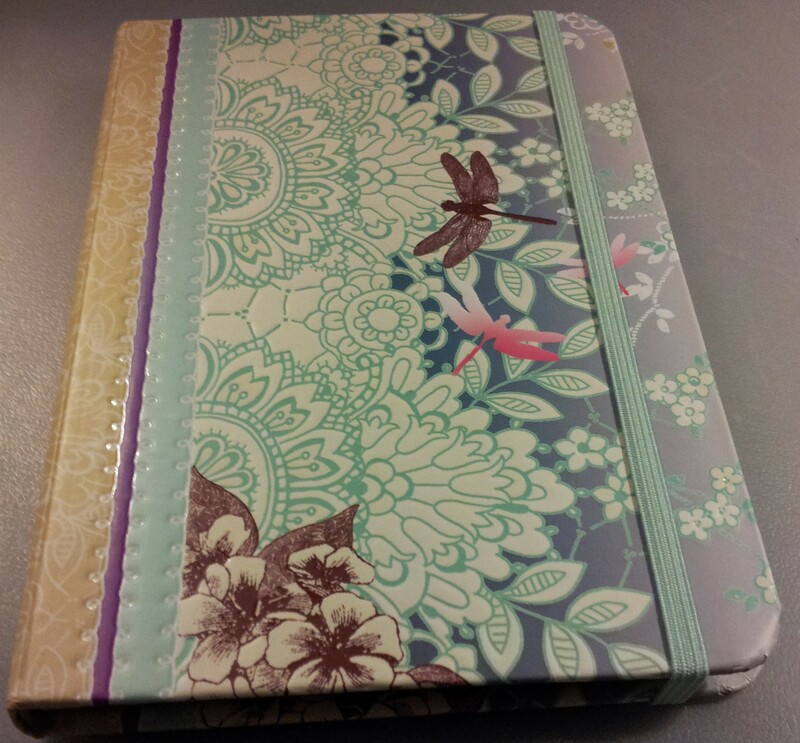 The notebook in the middle is a Peter Pauper Press notebook, a gift from my husband, and is the Dragonfly Journal. And finally the notebook on the left is from Mindspring Studio, with illustrations by Sandra Kuck, a gift from another friend. 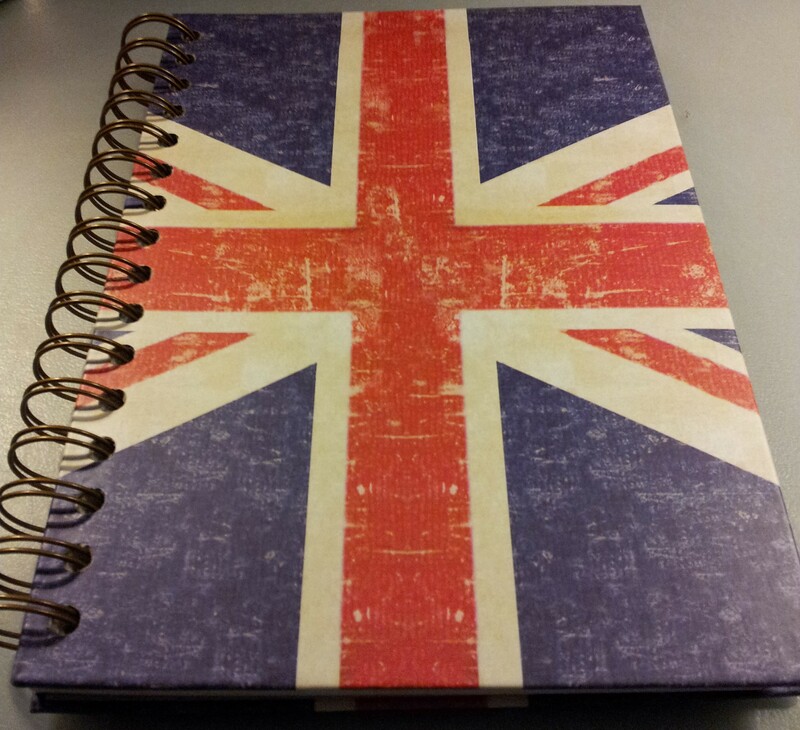 So up first is the iconic Union Jack notebook. Love that cover! And the cover art is carried throughout on the pages. It is a lot easier to see the pattern through the camera. It is super light in real life. 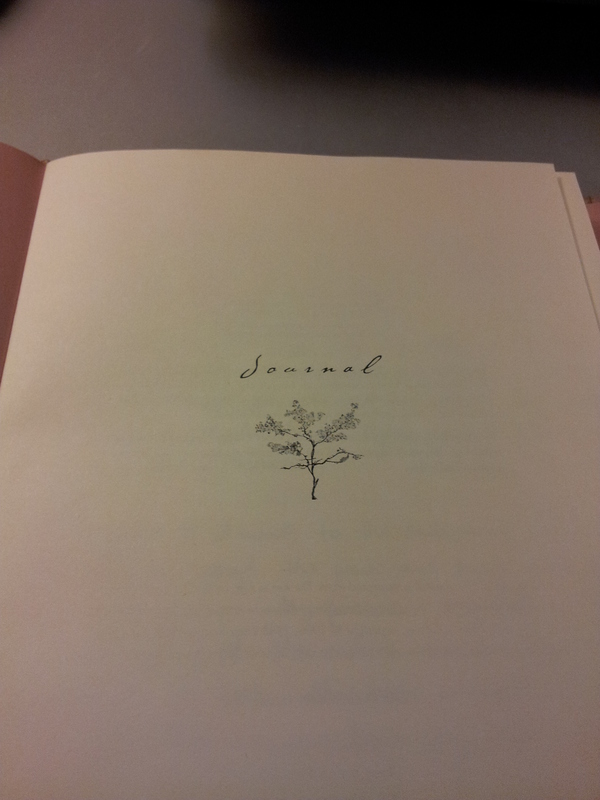 The pages are lightly lined and have a beautiful feel. 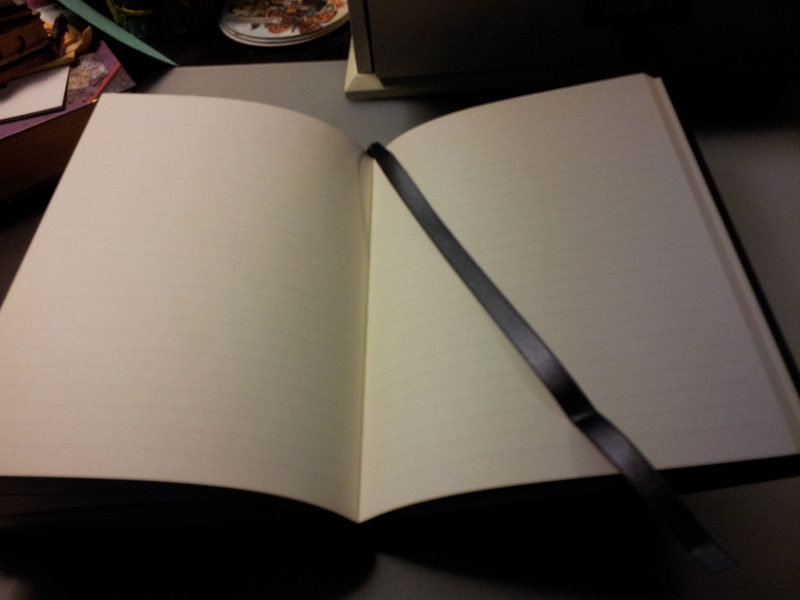 It’s a really sturdy notebook and the coil allows for the journal to lie completely flat. 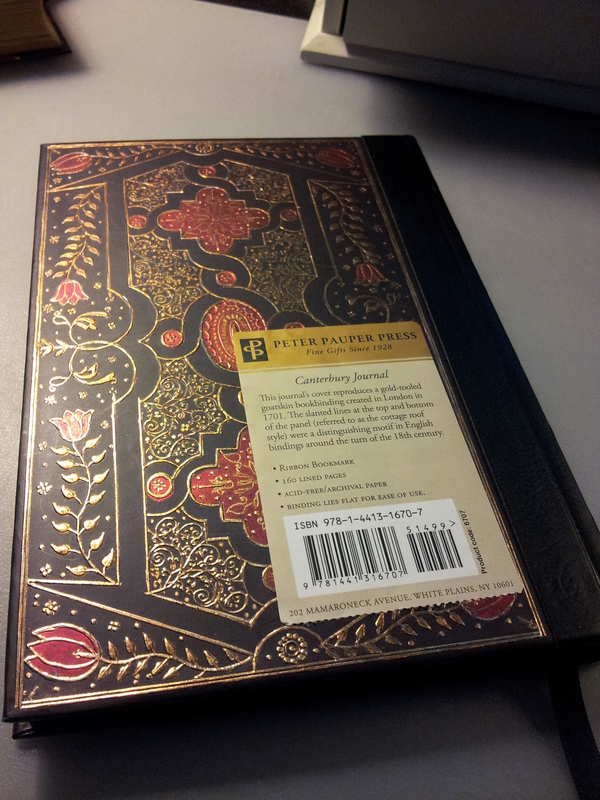 Very excited to use this journal. 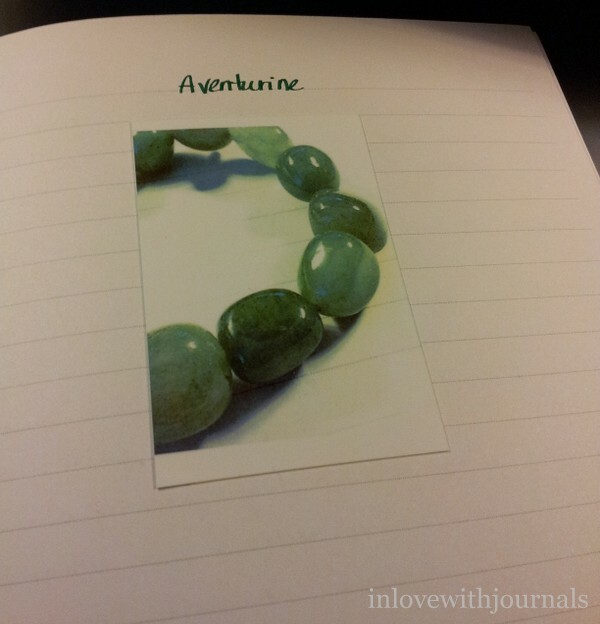 This gorgeous journal is from another friend of mine. It also lies completely flat, which is so great. 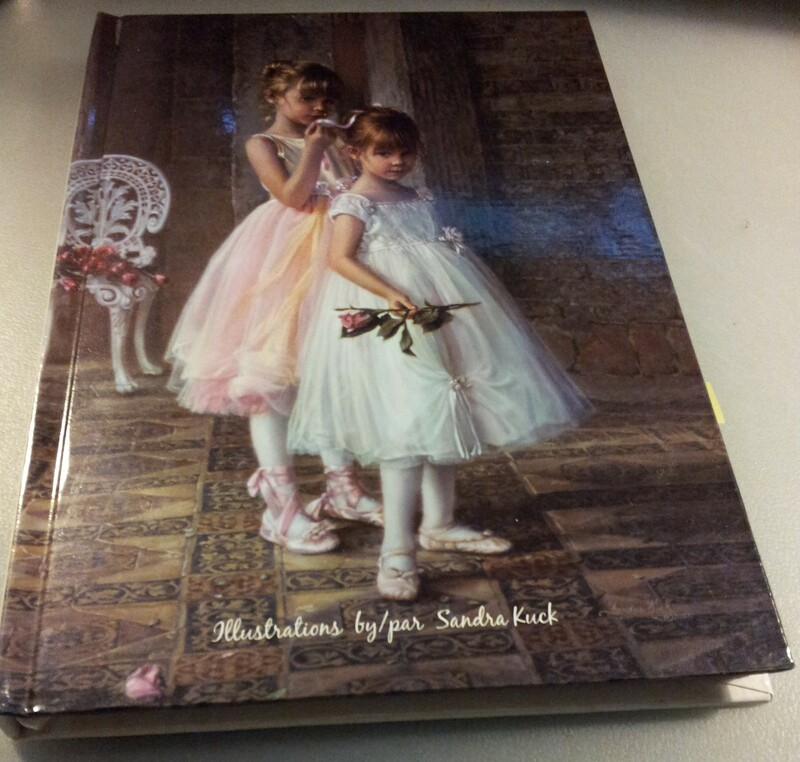 It has a white ribbon bookmark and wonderful illustrations throughout. Here’s an example of the amazing illustrations – an afternoon tea party! Each page is lined and watermarked, and each page has pink ballerina shoes in the corner. Very sweet. 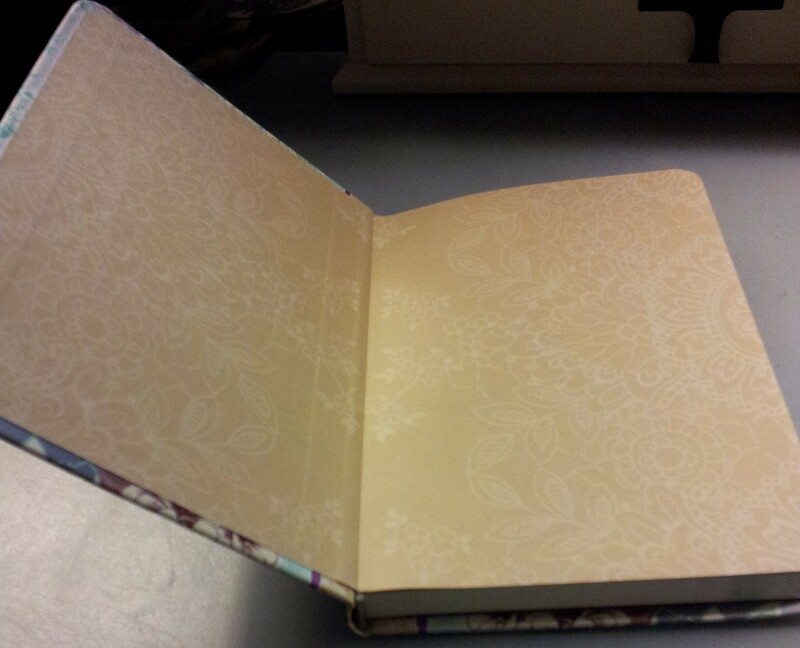 This notebook is so pretty I don’t know if I want to mess it up with writing! 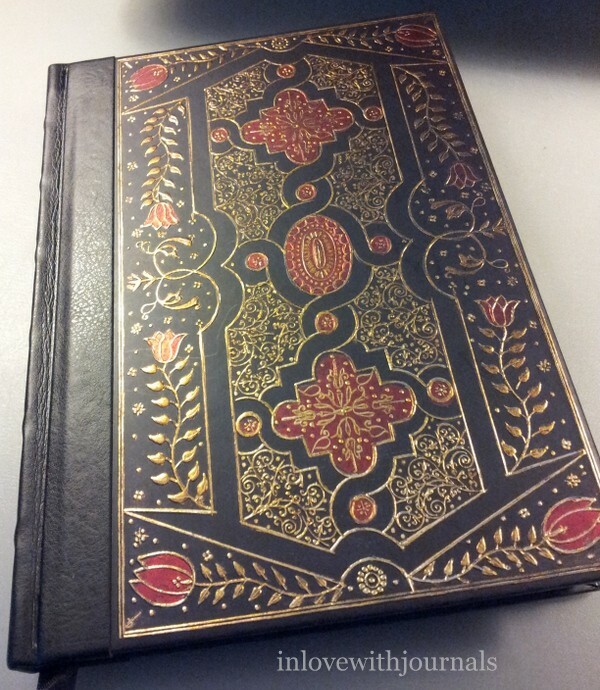 Lastly this glorious Dragonfly Journal from Peter Pauper Press. My lovely husband got this for me; it’s been on my Amazon wishlist for a while. I really love the Peter Pauper Press journals and this one is no exception. Beautiful endpapers. 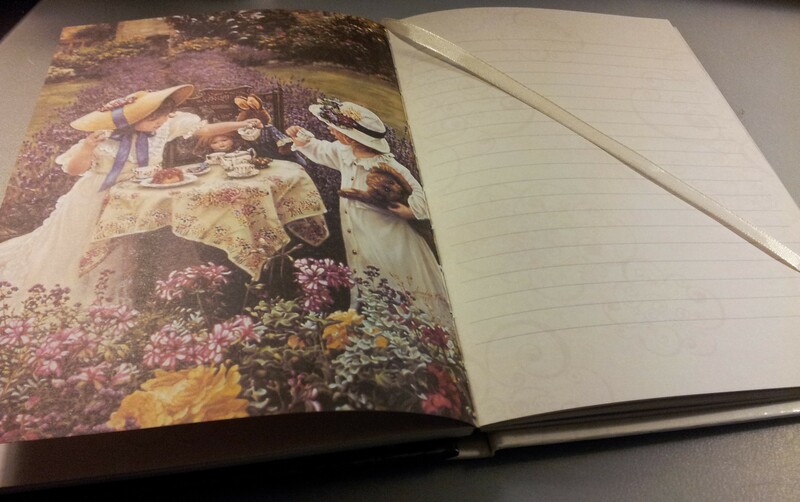 The notebook is lined and has illustrations on each page, in the corners. It doesn’t lie flat out of the box but would with use. 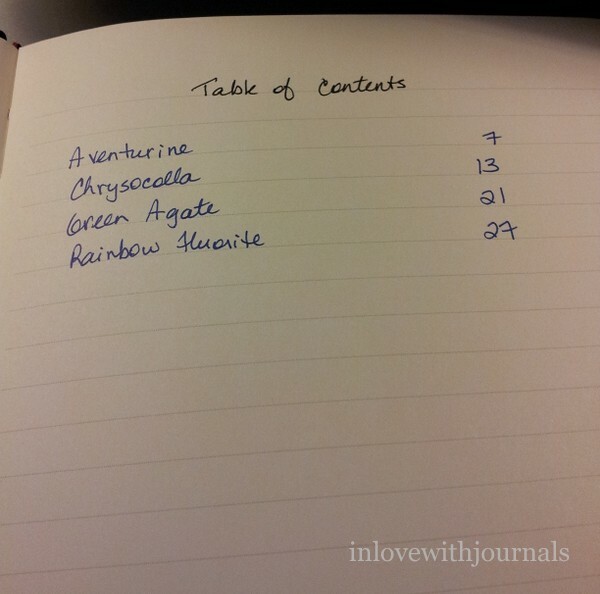 I’m fairly certain this will be my next journal, when one of my current journals is filled up. And that ends the parade of Christmas presents. I want to say a big thank you to everyone who gave me a notebook/pen/ink this Christmas; you have made me very happy and I hope I have done the same for you. Today I wanted to show you some notebooks and ink I received for Christmas from my husband’s side of the family. Waterman ink, Peter Pauper Press bird journal, Leuchtturm 1917 pen loop, Birds adult colouring book, and The Lotus and the Lily book. 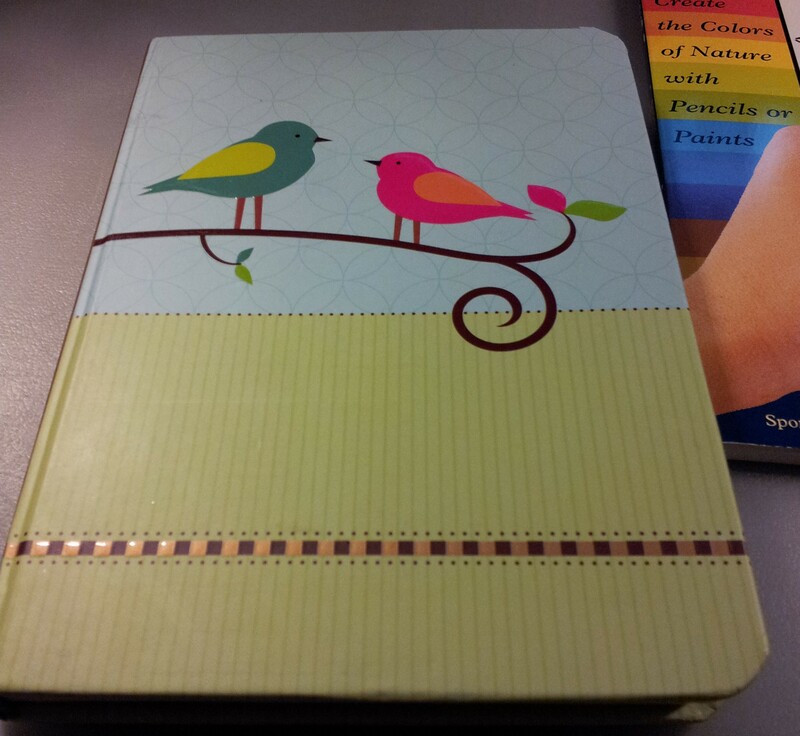 Let’s start with the bird journal. It’s from Peter Pauper Press. I love the bright colours and the birds of course. I’m becoming quite the bird lover in my old age and I’ve wanted this one for a while. 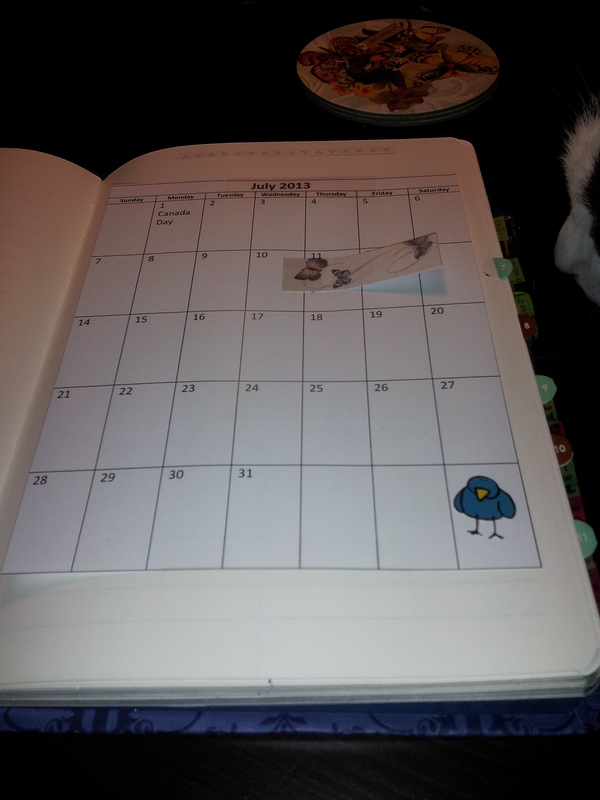 Here you can see the full colour birds are carried through onto the inside pages, which are cream coloured and lined. No idea yet what I will use this one for but it’s lovely. And I don’t know which journal will have the honour of receiving the purple Leuchtturm pen loop. 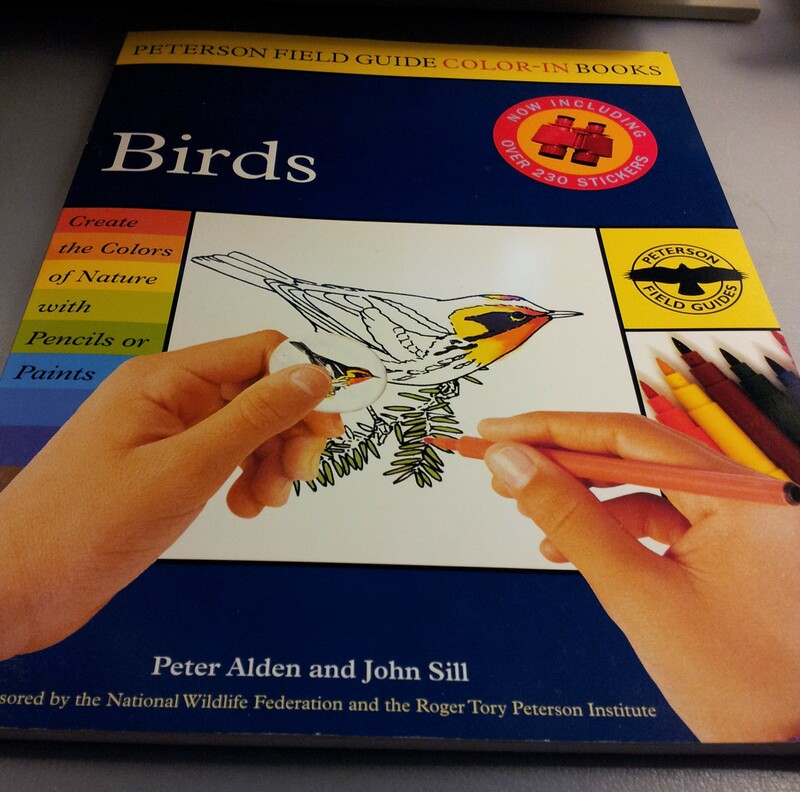 Next up is the Peterson Field Guide Color-In Book: Birds. I was thrilled to open this because I’ve seen other people relax while colouring in adult books and I earmarked a few on my Amazon wishlist. I thought this would be fun to do and maybe add some colour to my journal. 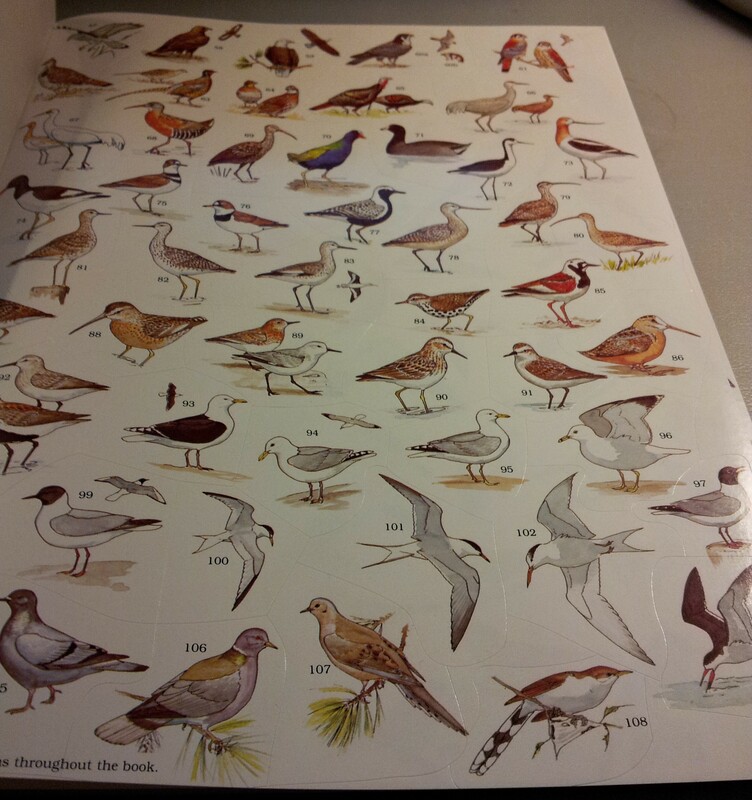 I’m so glad they included stickers of the actual birds; at least I have an idea of what the birds are supposed to look like. 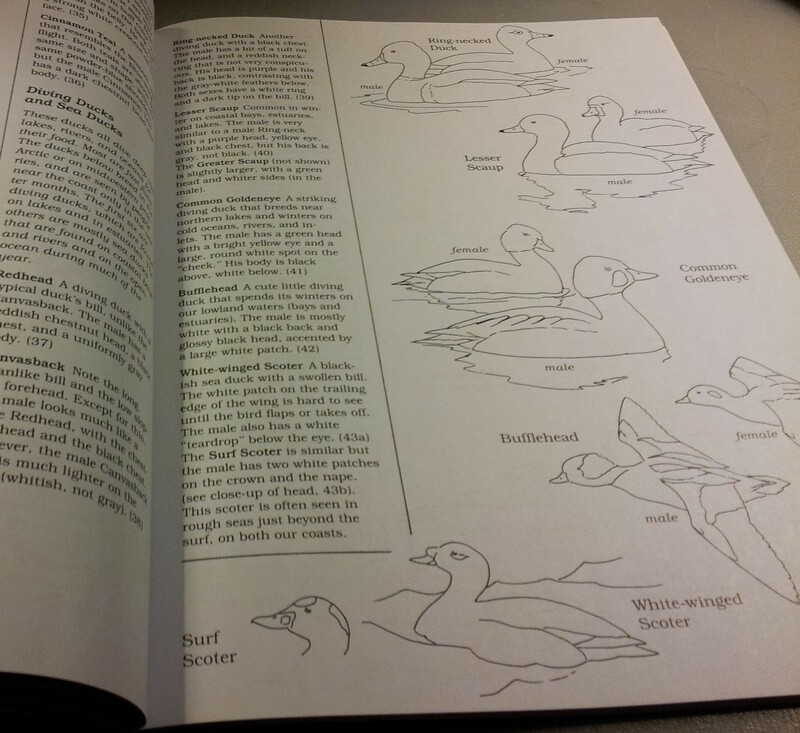 In addition to colouring there is a ton of info about each bird so it’s educational too. I’m excited to start colouring! 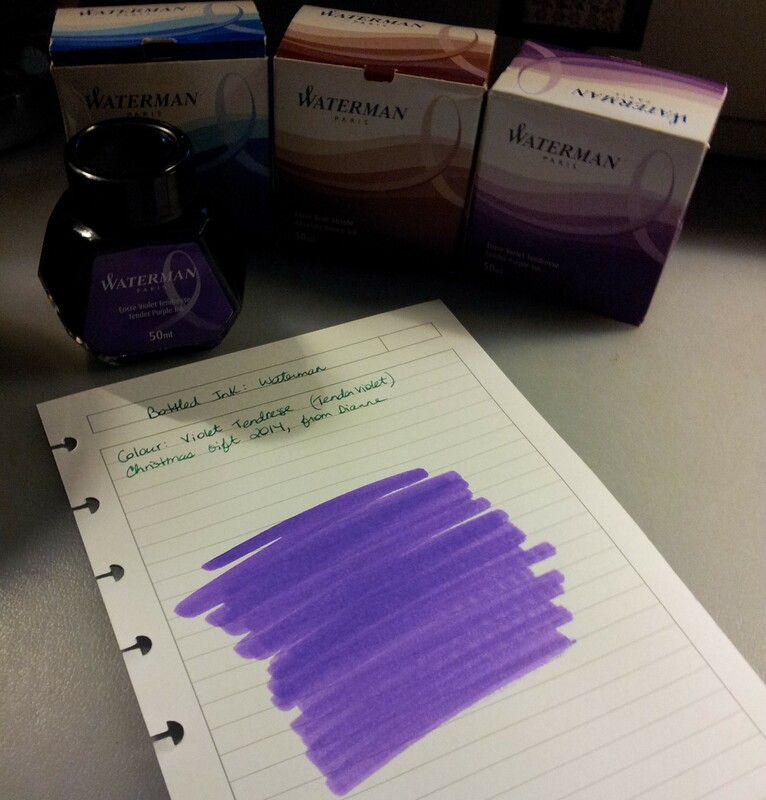 I also got 3 bottles of Waterman ink. Well that’s like getting 3 bottles of perfume for me so you can imagine how amazed I was opening that present! 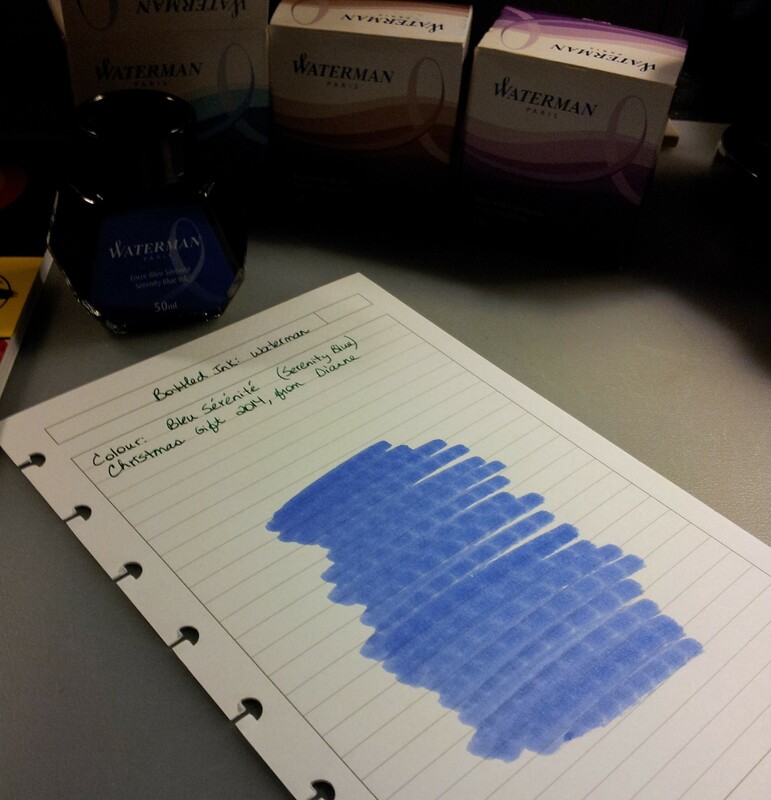 I didn’t ink up any pens with these inks but I took samples with cotton swabs to get an idea of the colour. I’ve heard so much about Serenity Blue and it really is beautiful. And yummy Absolute Brown. Looks like chocolate! And finally here is Tender Violet. I am truly blessed as I have enough ink to last the rest of my lifetime and beyond I think! Last but not least I had been interested in The Lotus and The Lily ever since I started reading Writing Down Your Soul by the same author, Janet Conner. I enjoy her writing so now I’m anxious to finish her other books so I can get into this one. I was very spoiled this Christmas; thank you to my amazing family! 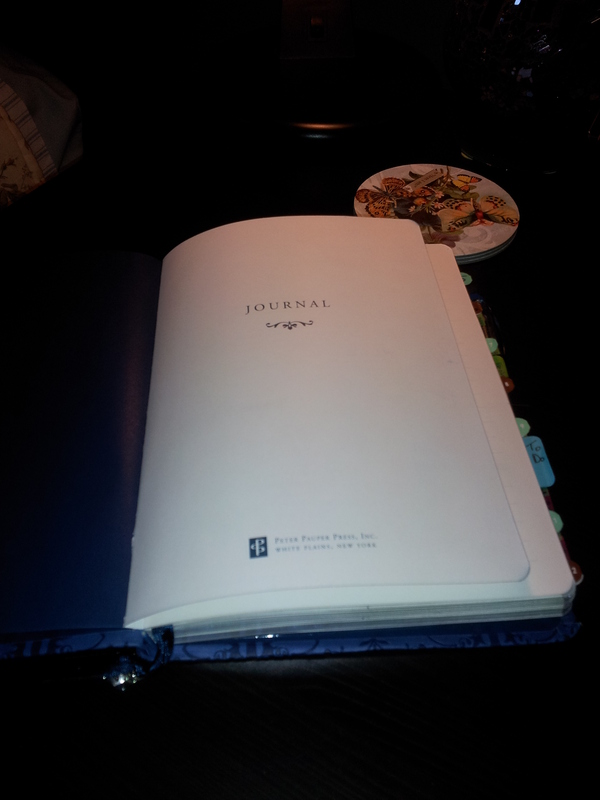 I have written 20 pages in my health journal, the Believe In Yourself journal by Peter Pauper Press. I’m a little obsessed about my pain levels and what medications I’m taking. I also haven’t been sleeping that much so I have had lots of time to write. I won’t go into specifics but it is helping me deal with a huge issue in my life right now. And I’m happy to report the tide has turned and I’m seeing improvement in my pain level and physical well being. Yay! We attended a party thrown by my husband’s work and it was a wonderful evening. The food and drink was exceptional but the most amazing part of the evening was watching my husband interact with his new co-workers (he started this job last May). He was lit up the whole evening, laughing and joking and introducing me to his friends. It was awesome and I am so happy he has finally found a job he enjoys with an incredible company. I can’t wait for the Christmas do! 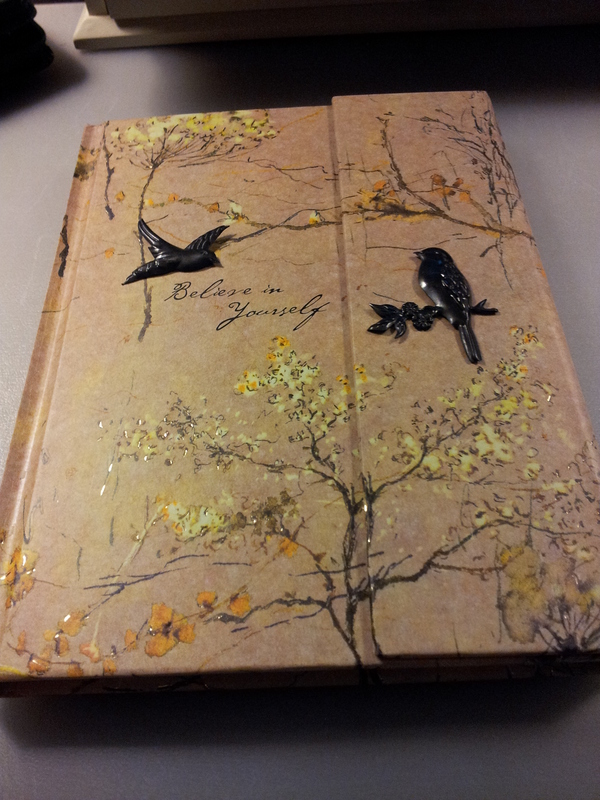 Here’s a new picture of my Believe In Yourself journal. I added metal bird stickers. What do you think? I love it! Some more items to share with you, given to me for my birthday. 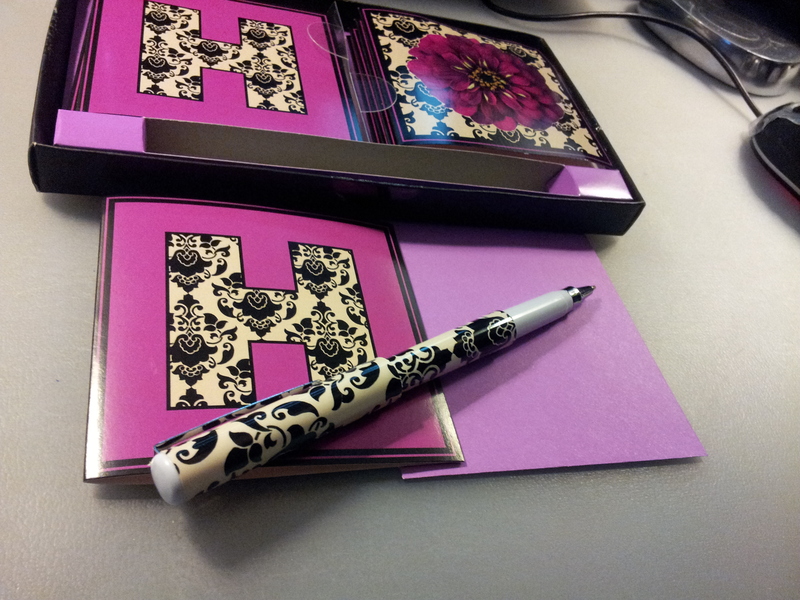 Let’s start with the pink, black and white notecard set in the foreground. There are 4 notecards of each type with matching pink envelopes. The pen is a ballpoint and writes quite nicely. According to the bottom of the box it comes from Michael’s. I love the colours and the matching pen. 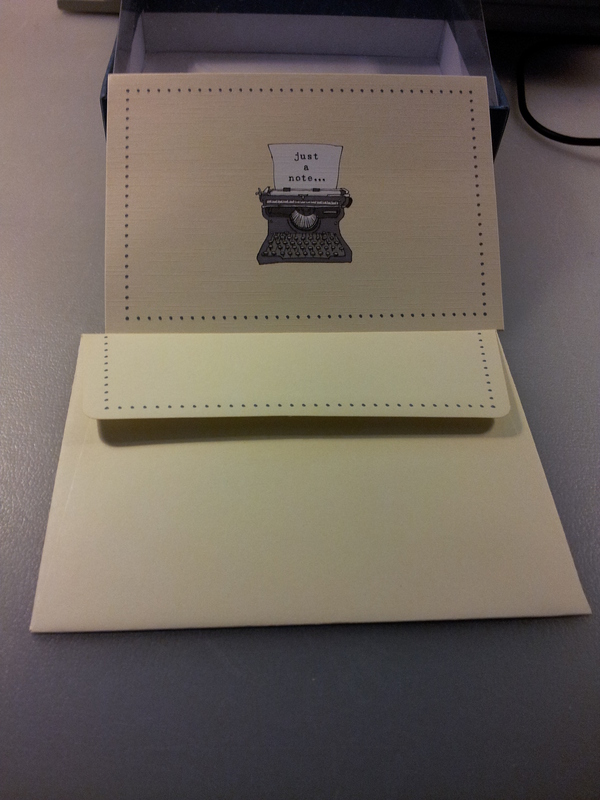 Next up is the typewriter notecard set from Peter Pauper Press. 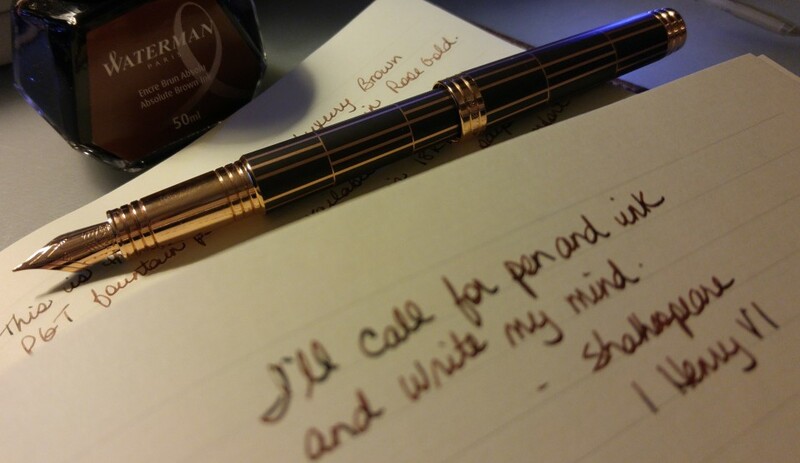 I love these and they take fountain pen ink beautifully. I wrote 4 letters on this stationery last week. I love cats and my friends know this! The bookmark is from Antioch and the page flags are from Girl of All Work accessories. I love these page flags; they stick properly and are really thick. Fabulous. Finally we have this breathtaking Canterbury Journal from Peter Pauper Press. It’s navy blue with gold and red accents. So beautiful. I just love Peter Pauper Press products. The pages are lined and the paper is a heavy cream. 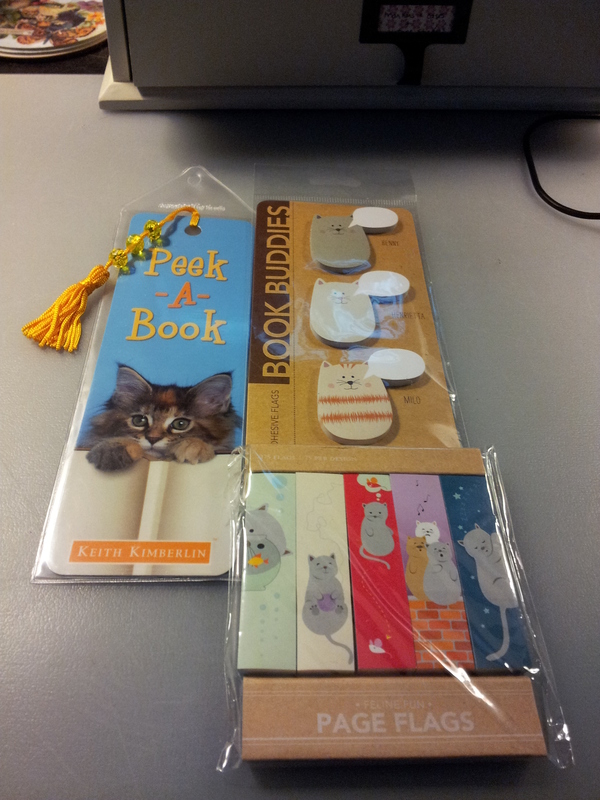 I love the navy bookmark. One thing I have to say about Peter Pauper Press: they coordinate their bookmarks to their covers, which I love. Paperblanks are you listening?? This journal’s cover reproduces a gold-tooled goatskin bookbinding created in London in 1701. The slanted lines at the top and bottom of the panel (referred to as the cottage roof style) were a distinguishing motif in English bindings around the turn of the 18th century. And that’s it. So spoiled. Thanks to everyone who gave me such amazing gifts; I am truly blessed, not because of the gifts but of your friendship and love. Thank you. 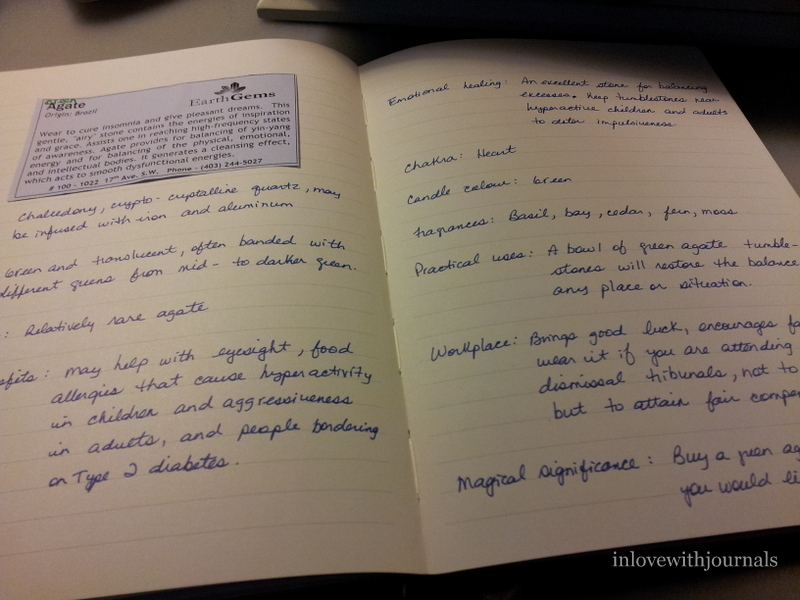 I’ve written before how journalling can be healing, can be a form of therapy. It’s a safe place to dump thoughts and feelings, and explore your emotions and hopefully learn from your experiences, and grow as a soul. This past week I found myself under doctor’s orders to stay home and focus on my health, on returning it to “normal” (whatever that is) as fast as possible. 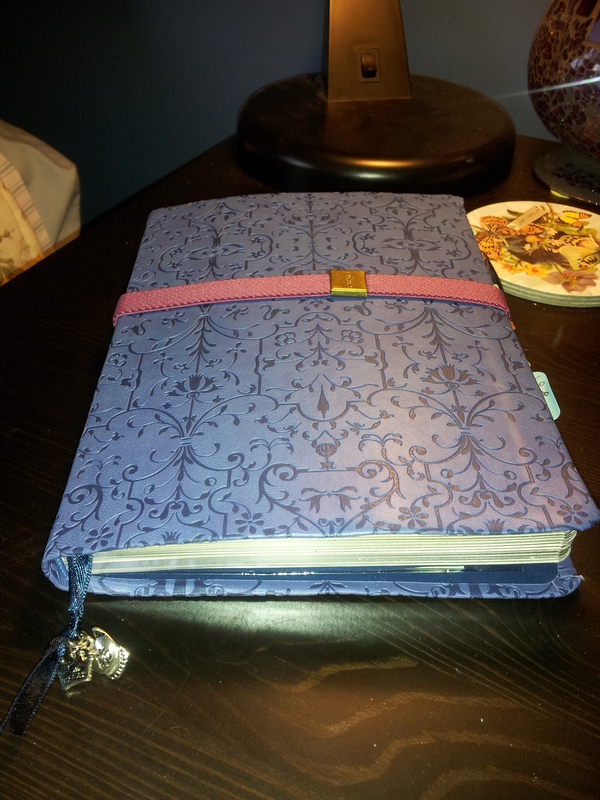 I started writing in both of my current journals (the Paperblanks Blue Filigree and the Winnable Leather Journal) but I wanted a dedicated space for research and observations. 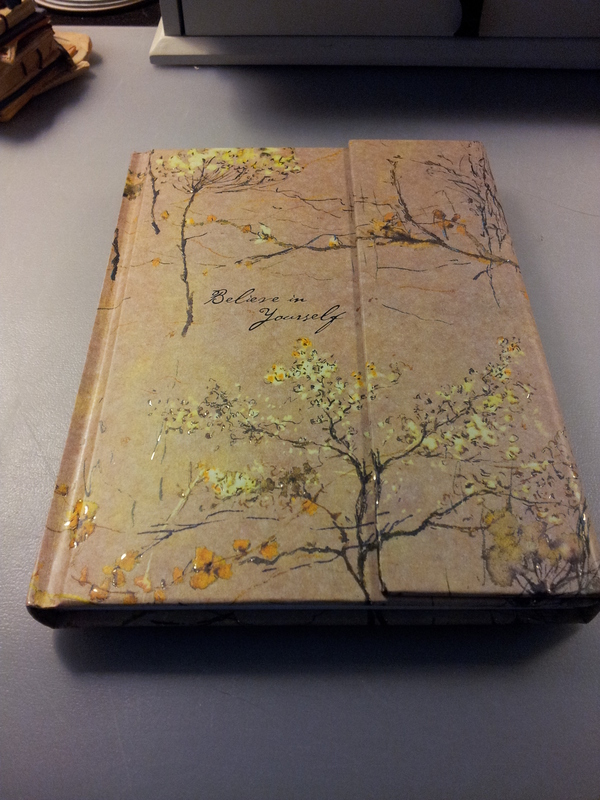 I found myself reaching for a journal I’ve had for a long time, so long in fact I no longer remember how it came to me. But it was perfect and I started writing down all the information I could about my condition and pain levels and how I was managing (or not, depending on the day). The activity focused my mind on something other than the pain, which was exactly what I needed. You don’t need a loud voice to be heard. All you need is something worthwhile to say. 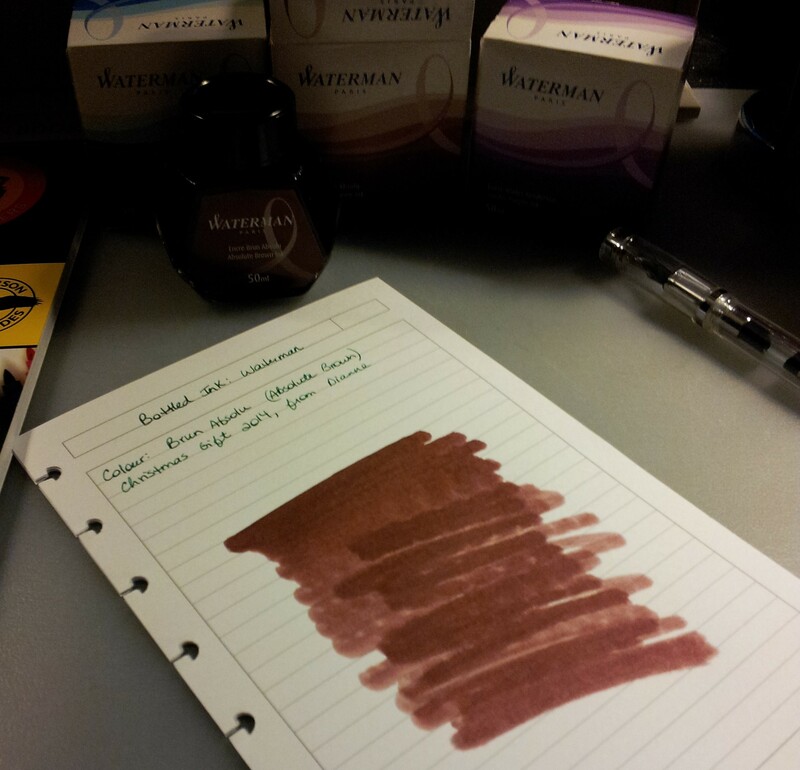 The cream paper is lovely and takes fountain pen ink with no feathering or show through. I also used gel pens for different sections. 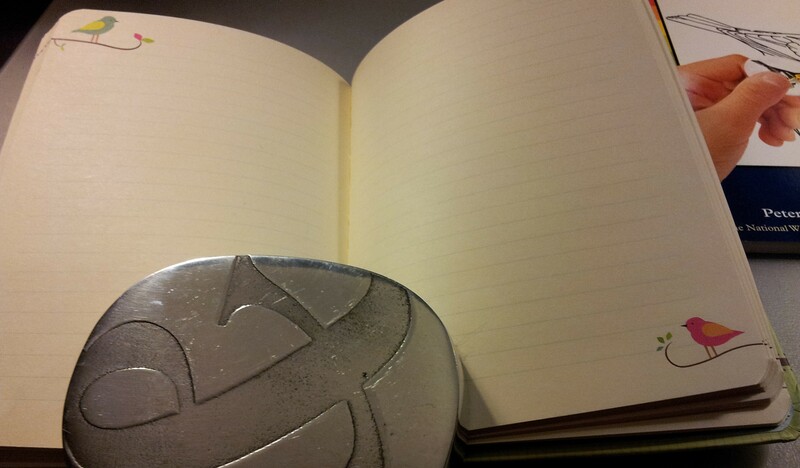 The journal closes with a magnetic flap. 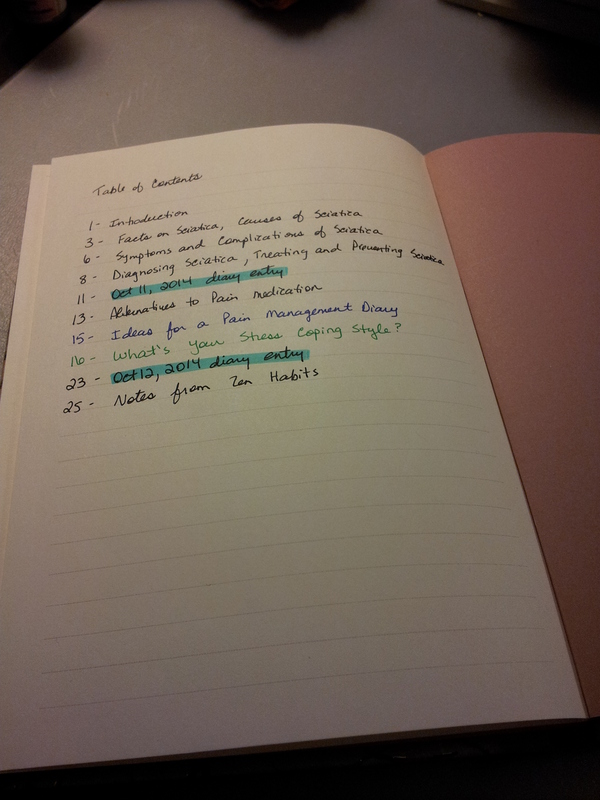 I’ve numbered the pages and started a Table of Contents at the back. I should have left a few pages at the beginning for this but I didn’t think of it. It works just as well starting from the last page. Yesterday I started including diary entries in this journal, as it was just easier than going back and forth between my everyday journals and this one. I want this journal to contain articles I want to copy out, lists of the fears I have for dealing with this condition, plans of attack for how I will change aspects of my life to meet the treatment goals, and strategies for how I can stay committed and motivated to carrying out those plans. Just as a book finds its reader at the right time, this journal found me when I needed it most. And I am very, very grateful. I feel slightly embarrassed by this post. 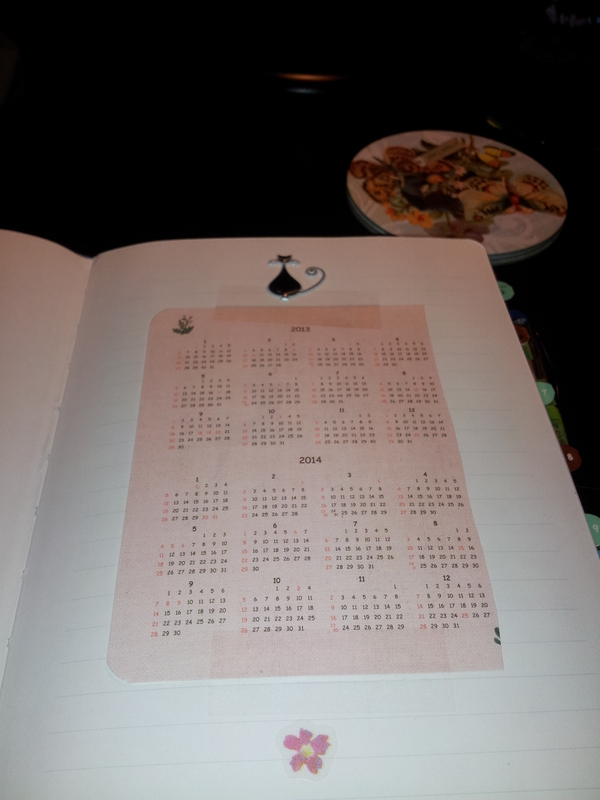 I’ve become dissatisfied with my 2013 Planner (read about it here). I admire many of the features of the Episode Planner but my big beef is that it doesn’t lay flat. I have been thinking about investing in a Midori Traveler’s Notebook but I find it hard to justify the expense at this time. 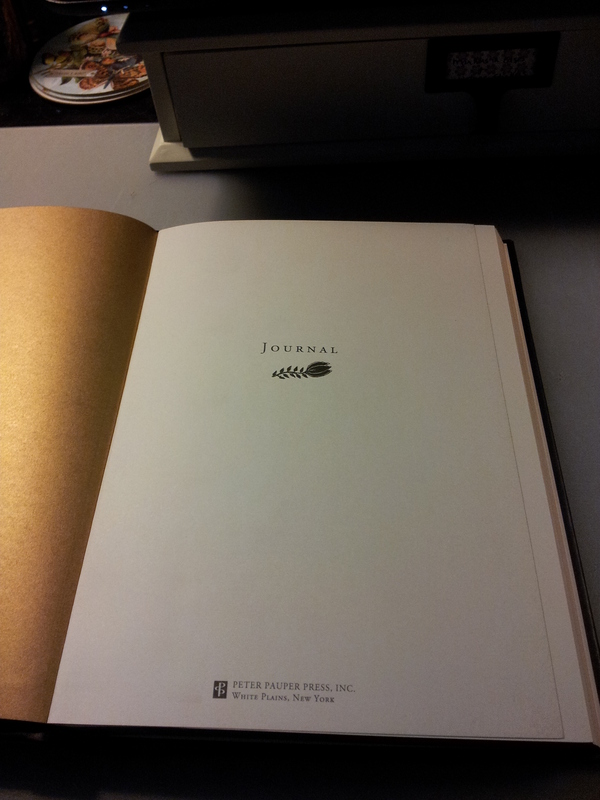 The cover feels like soft leather and it is embossed as you see here. I added a couple of charms to the bookmark. I like stickers and like to use them to give myself motivation or to just make myself smile. I added a Blueline clear envelope to the left side of the cover. 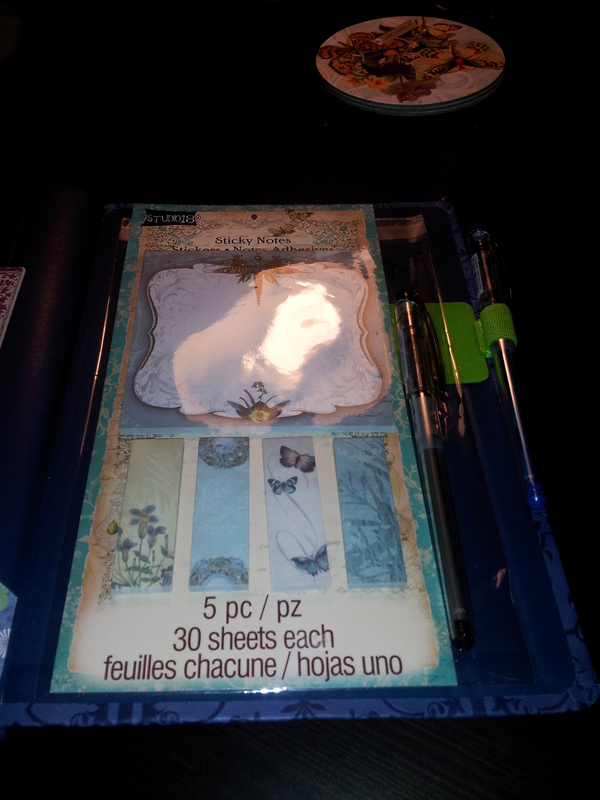 I picked it up at my local stationery store for $.59! I attached my business card to the fancy paper on the right. These year calendar pages are from an older planner from a previous year. 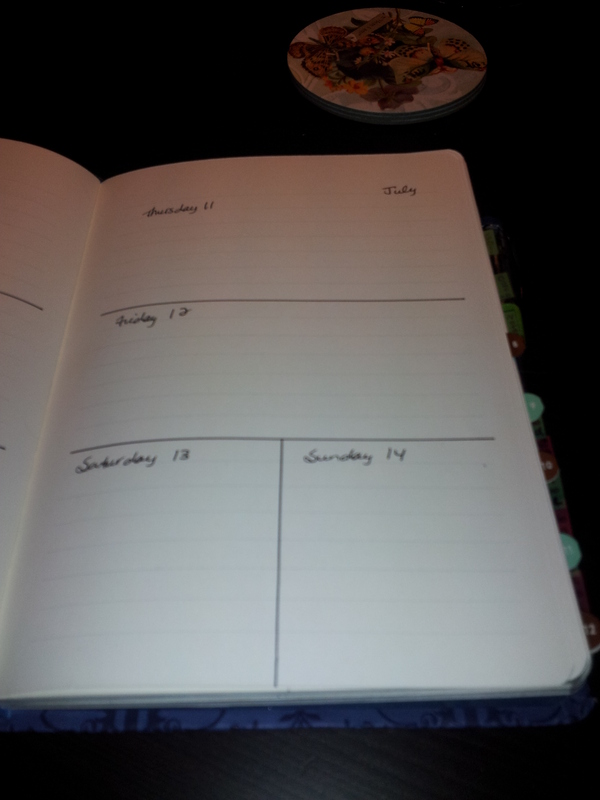 I printed monthly calendars and stuck them in throughout the journal. The weekly pages. 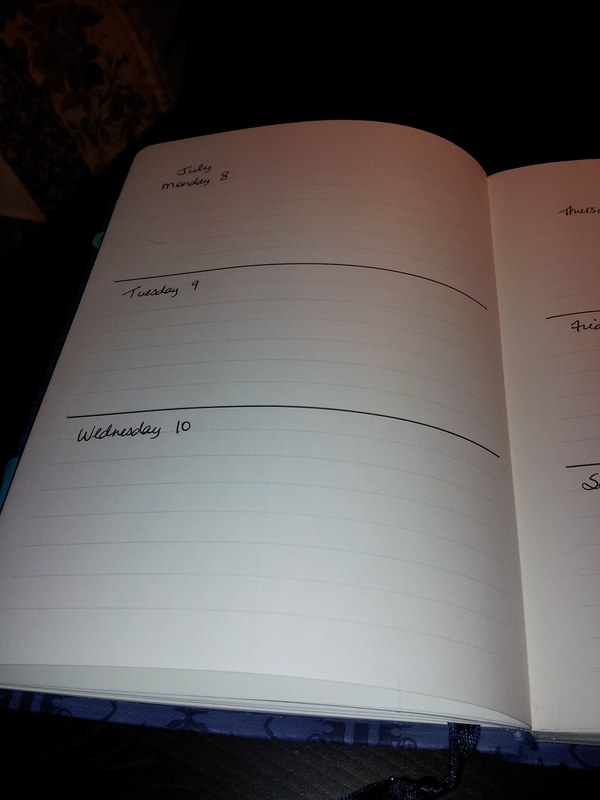 I drew lines with a ruler and left lots of space for each day. I thought about having the week on the left side and a blank page on the right for notes but in the end decided on this format. I usually do not have as many to-dos on the weekend so I’m ok with the smaller blocks. 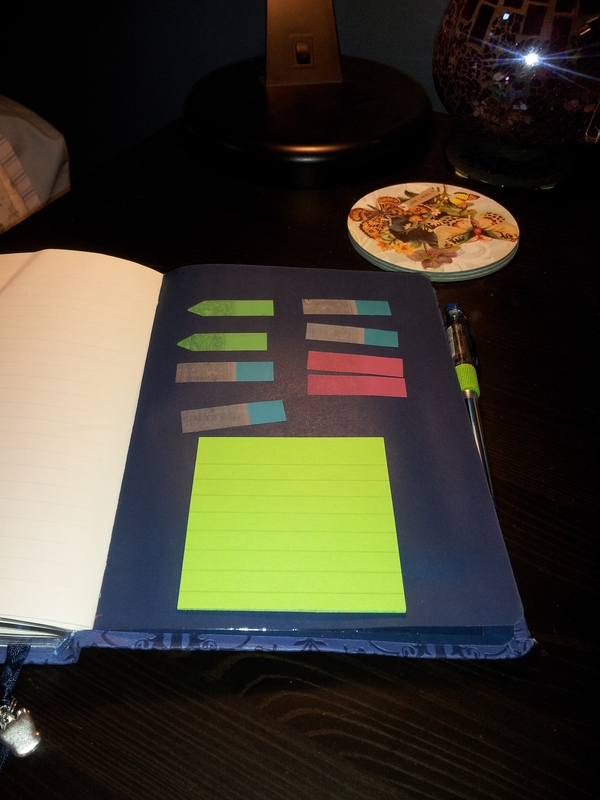 I used numbered tabs as monthly dividers and sticky flags for other dividers. 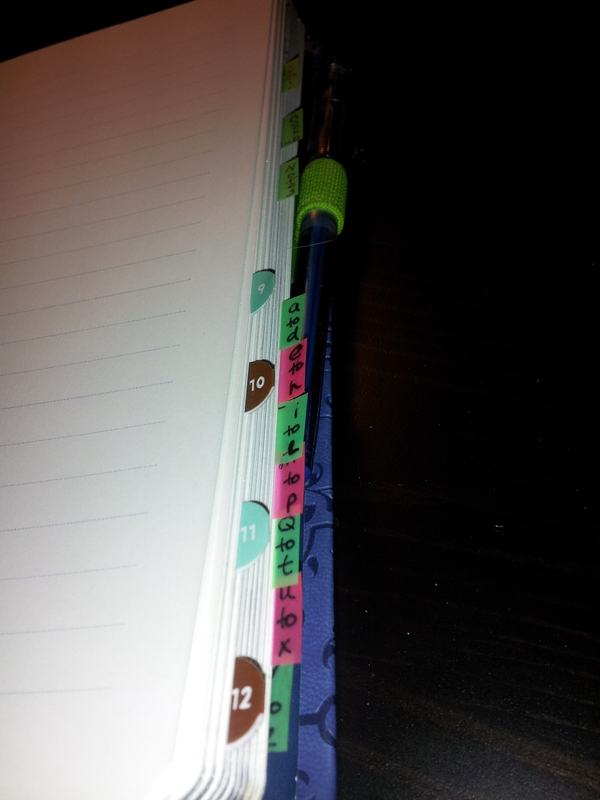 I like the small tabs as they do not stick out when the journal is closed. 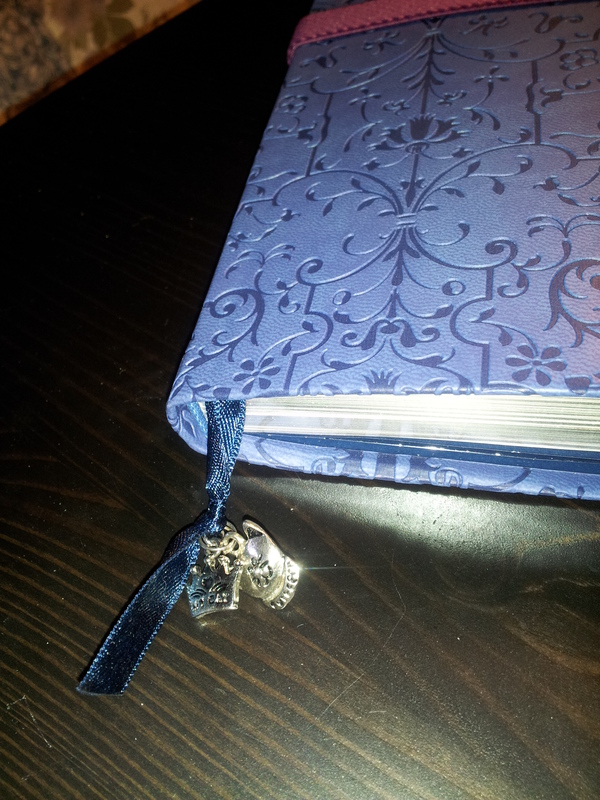 I also used one of my Leuchtturm pen loops. 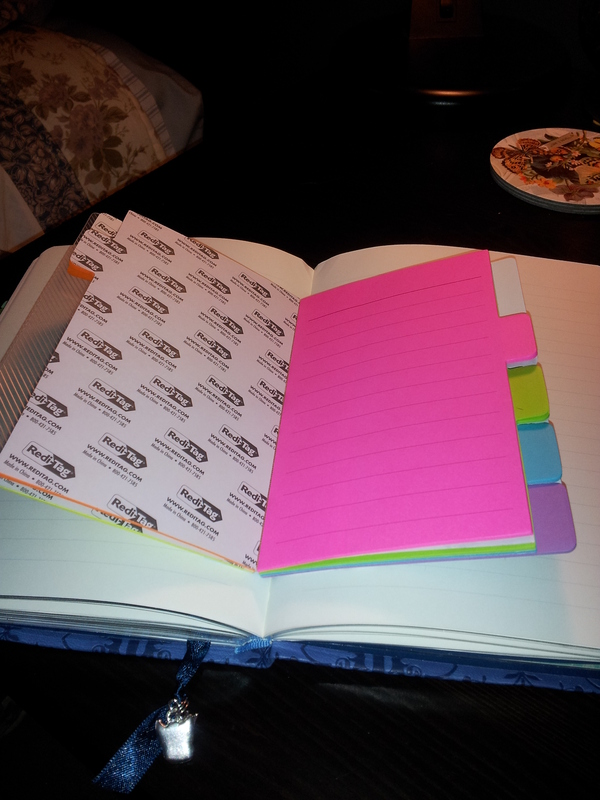 I picked up these sticky notes and thought I might use them as my re-positionable to-do list. I loved lined notes. I like the writing to be straight and neat. 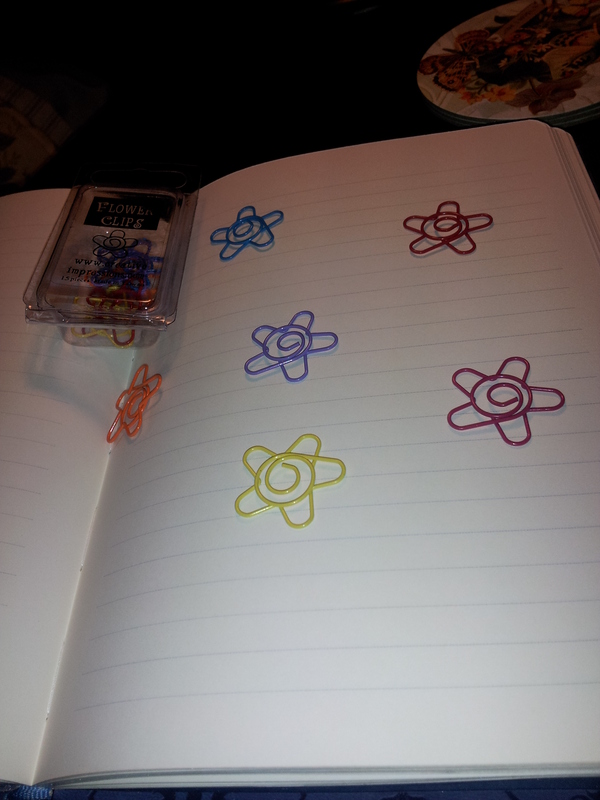 I also picked up these fun flower paper clips. So excited to find Pentel Slicci 0.4mm pens! I first found this type in London in 2009. I’ve been looking for them ever since and have not been able to find them in Canada. So I was so pleased to find a local stationery store carries them: Reid Stationers. They have them in 0.25mm, 0.4mm and 0.7mm, for $3.50 each. I haven’t been to Reid’s in many years, as they are located in a busy downtown area that is a challenge to get to. But I braved the traffic and distracted pedestrians on the Saturday morning of the May long weekend and was able to spend a blissful 2 hours looking at fountain pens, gel pens, ballpoints, Filofax inserts and binders, Leuchtturm notebooks, the full range of Moleskine notebooks and accessories, sticky notes, paper clips…… Heaven! I stuck extra flags and a few sheets of a pad of sticky notes towards the back. I made this simple flap to keep extra stickers and my most portable copy of Shakespeare’s Sonnets (I am never without them). It’s hard to see in the photo but I attached a glassine envelope (also purchased at Reid’s for $0.25) to the back cover. This can hold anything really but right now I keep some fancy stickies and an extra pen here. I’ve been using this planner for a couple weeks now and it really works for me. Here’s to hoping I can last the rest of the year with it!